Can You Diagnose the Mystery Illness in Sudden Death? I’m really excited about today’s Book Blitz Month book recommendation because I’m a huge fan of medical thrillers, especially when it involves mystery illnesses! 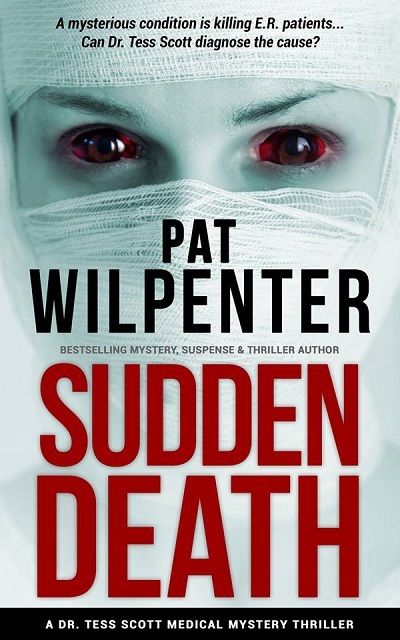 Pat Wilpenter’s Sudden Death is the first book in the series, but each book is designed to also stand alone. If you enjoy medical thrillers and mysteries, especially with a hint of sweet romance, it’s time you met Dr. Tess in this FREE short story. It’s just 34 pages and early reviewers have really loved it. Young Dr. Tess Scott is utterly dedicated to using her medical skills to relieve human suffering. And that was working well enough until one particular Tuesday when a mystery medical condition starts killing hospital patients. Her investigations spiral into unexpected dangers in this fast-moving medical fiction. If you love medical thriller books, you can download the first Doctor Tess story today and enjoy crisp clean language as you get to know a heart warming heroine. It’s Book 1 of a series and can be read on its own. In Book 2 (“Young Blood”), Tess confronts a new challenge. This Tuesday night would be like no other for 29 year old Dr. Tess Scott. Tess was in charge of the Emergency Response ward on the ground floor of CityWest Hospital and at 2 in the morning she was taking a short coffee break. So far, the caseload had been normal. “Well, as normal as it ever gets in ER,” she said to herself. Her mid-shift pickmeup was coffee. Fair Trade coffee. Not so much for its flavor, but for the fact that the profits went to help poor families in the Third World. Tess took one last gulp of the hot brown brew then made her way quickly to the ER entry foyer where the ambulance crew were completing their delivery paper work. They had just wheeled in a middle aged man in work clothes. Tess immediately noticed an “other worldly” pallor to his skin… a hint of blue and gray. He was groaning and writhing in evident pain. “The poor guy,” thought Tess. “If you weren’t strapped onto the gurney, mister, you’d have thrown yourself off it, onto the floor.” She often talked to herself when she was assessing patients. Especially the ones who couldn’t answer for themselves. It helped Tess to humanize her patients. Maybe they couldn’t tell her what she wanted to know, but Tess could answer for them. Well, this patient was barely coherent but she did manage to get his name. Jorge what? – she didn’t know. The rest of whatever he was trying to say was slurred. Tess knew she’d get nothing more from him for the time being. They would have stabilize him first. “Initial diagnosis? Let… me… see…,” mused Dr. Tess. She still wasn’t sure what the underlying cause might be. Actually Tess was stumped. After watching Jorge a little longer, seeing him thrash around in obvious agony clutching at his stomach, Tess decided to run with abdominal cramps – at least for now. Moments later, Jorge screamed in pain again but this time his big industrial hands clutched his head, one hand each side, and he squeezed his skull hard. She took note of the wedding band on his left hand. And that was all she knew. None of her initial diagnostics had taken her any further. This was going to be a tough one! But one thing was clear – the patient was deteriorating. Fast. His contortions looked like epilepsy. But he wasn’t wearing the epileptic notification necklace that the American Epilepsy Society recommended. So maybe he wasn’t an epileptic. I grew up in a simpler time with my younger brother, a pushbike and a floppy-eared Cocker Spaniel. And of course a Dad and Mum. My Dad was a hard working fellow who was always there to help friends and neighbors. He’d started life in a small coastal holiday town, working first as an apprentice tailor. My Mum was a farm girl who met my Dad when they were both in the Air Force. After they married, Mum did a stint as a dental nurse during the evenings to save up the money to buy a piano. Music figured prominently in our house. Mum played the piano for church. And we had many a singalong on nights when friends came over. And yes, I took piano lessons in case you were wondering. Dad had built a brick barbeque in the backyard. A solid structure with quite a tall chimney. And it got a solid workout over the years because my childhood was blessed with many happy backyard barbeques with the kids scampering around and generally having lots of harmless fun. Those evenings almost always finished up with most of us gathered around the piano for a singalong. With (or without) my brother, there were many bike rides from our house… over the big hill… and down the other side to the local surf beach. We didn’t have the money to buy a surfboard but that’s okay because I could never figure out how to stand up on one of those things anyway. Ah, but body surfing — that was my thing. Loved it. And no, I was never bitten by a shark or drowned. Shark sightings were not uncommon. But we felt safe because all through the long beach season, volunteer life savers kept watch from their high observation towers. When the shark alarm sounded, we all swam like champions to get out of the water. Education? Yes, my folks didn’t have much opportunity when they were young but they saw its value and we were given every encouragement to do well in school. Which we mostly did. My education has been all over the place, literally… from failing my first (and only) shot at economics at university, then off to the UK where I completed a BA degree with majors in theology and communications. While living in Sydney many years later, I picked up a Diploma of Freelance Journalism and then a computing degree. We’ve now retired and finally I’ve got time to start writing stories. Ack! I got so engrossed reading the excerpt and now I have to get a copy of Sudden Death. It sounds like something I’d enjoy reading. It’s a good change from the super love stories. Medical thrillers are my kind of thing. Hi there! Visiting from an Alexa thread! This books sounds right up my alley…and such a great review! I’m definitely going to add it to my list of books to read in 2015! I am always looking for new books and short stories, and this one definitely sounds great! The short excerpt was so good and quick-moving, always what I enjoy in a book. My husband is a big reader and is always looking for new reads. This one sounds SO awesome that I may even pick it up! Thank you for sharing! Got a new book on our lists! I have been looking for a new book to read!! This one sounds like a really good book to read. Thank you for the recommendation! I love medical thrillers (Robin Cook would keep me up alll night reading)! I want to read this! I am going to order it asap as it’s right up my alley! This sounds very intriguing! I do love a good mystery! I will have to check this out! This books sounds interesting! You sure nailed the review. I will surely check this book. Thanks for sharing! I love medical mysteries and would love to read this book. The whole series would be my goal to read really. This would be a great gift for my mom who loves reading any mysteries. Thanks for sharing. Looks like an interesting book. It’s not the genre I usually read but I’ll have to branch out and check this one out. This book looks really interesting and a good read. I’ll have to check it out next time I’m at the library! Wow this book looks really good!!! Might have to add it to my read list!! I’m not usually into short stories, but this sounds very interesting. Thanks for letting us know about it and how we can get it! This looks like a great short story — I’m intrigued! I’ll have to check out this series. This sounds like it is a very interesting read. I will definitely have to look into this book more. As a mom I do try to read at least 1-2 books a year, mostly they are Jacki Collins novels and on occasion I will venture to James Patterson. This series looks intriguing I would love to read more. Thank you for sharing. Thank you for checking it out! I hope you enjoy it!